After you have a decent, well formatted book, it’s time to set up the print and e-book distribution. Before we get to that step, you may well have elected to use a multi-service company to get to the formatted stage. There are two main companies (probably more) that help you get there. I-Universe and Create Space. I-Universe is a bundled service—editing, design, and such and Create space is an alla Carte service. I personally don’t use either. I hire people who work in the industry, often they work for the big 5 during the day and for me at night. I only pay for the hours I use. Changes in Print on Demand (POD) has changed the whole business model for publishing. Today, you can print and mail a single copy of a book for not much more than the per-book cost of printing and mailing thousands—no more need to make big runs. Together with the freelance expertise available the independent publisher can turn out books every bit as good, and often better than the big 5 for less cost. I say better because indies aren’t constrained to only pursue a narrow spectrum of books (the big 5 hate to take chances and will mostly push things that they think are guaranteed to sell) this means that great book that doesn’t have an action sequence and cliff hanger in every chapter may never make it. To Kill a Mockingbird would probably never be published by the big 5 today—but it would by an Indie. E-Book distribution is a big space still, although Amazon has been strong-arming the competition. Ultimately, there is no real material cost, just labor involved. You set up contracts with each distributor and they take care of the accounting and pay you as books are sold. They also issue W-9’s. As a publisher, you also need to issue w-9’s to people you hire. Its best to start an LLC comapny, with may cost 50 dollars to set up, but you’ll need accounting help as well—again, freelance. There are still obstacles to overcome for Indies. many reviewers haven’t caught on yet that the days of the big 5 and the dependent publishers are numbered and may refused to review your books. The book publishing industry is following the path that the music industry followed. I doubt that the big 5 will be there ten years from now. They can morph into something else, but you can’t fight the tide of an inferior business model. 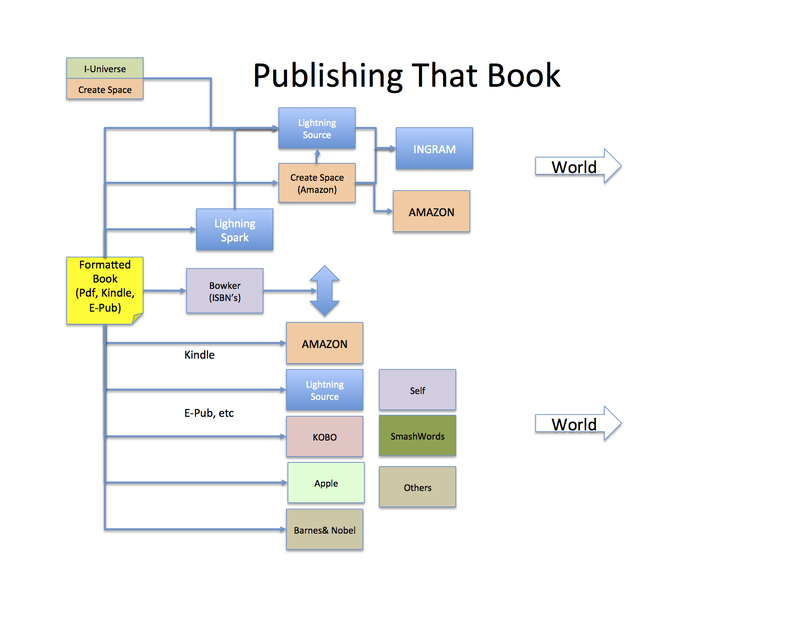 Obviously, this is a fairly simplified process diagram and I’ve either glossed over or barely touched many details, but it provides a basic understanding of getting the book out there. Next will come publicizing what you’ve published. I’m still learning this and have learned more of the mistakes I’ve made even as I go on.